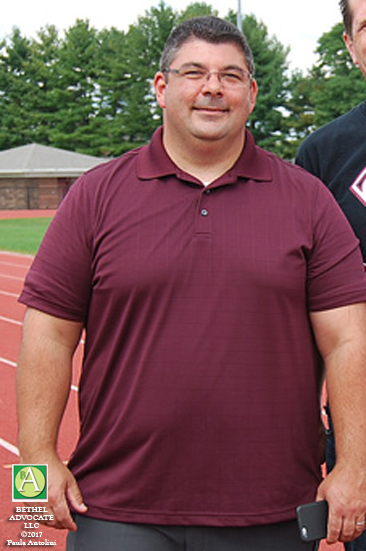 Photo above: Bethel High School Principal Christopher Troetti at the Bethel track and field where the Walk Out event is to be held on March 14th (Bethel Advocate file photo). Bethel High School (BHS) Principal Christopher Troetti issued a letter to students, parents and guardians today about the national Walk Out demonstration planned for March 14th during school hours (exactly one month after the Florida school shooting) giving a voice to students regarding issues about the recurring school tragedies. Next Wednesday’s demonstration originated from the “#Enough National School Walkout” which is by the “Women’s March Youth EMPOWER” … “calling for students, teachers, school administrators, parents and allies to take part in a #NationalSchoolWalkout for 17 minutes at 10am across every time zone on March 14, 2018 to protest Congress’ inaction to do more than tweet thoughts and prayers in response to the gun violence plaguing our schools and neighborhoods,” the website reads. They urge participation in a walkout demonstration to demand action against gun violence. A March 24th Saturday event, named “March For Our Lives,” will take place nationally, where “kids and families of March For Our Lives will take to the streets of Washington DC to demand that their lives and safety become a priority and that we end gun violence and mass shootings in our schools today. March with us in Washington DC or march in your own community. On March 24, the collective voices of the March For Our Lives movement will be heard,” the website reads. “Another national walkout is planned on April 20, which will mark the 19th year since the Columbine High School massacre in Colorado that left 13 dead. More than 22,000 people have signed a petition, pledging to walkout of their classrooms that day at 10 a.m. for the rest of the day,” reports USA Today. As many of you are aware, the issue of school violence, particularly since the incident in Parkland, Florida has caused students across the country to effect change in order to reduce these recurring tragedies. In our region particularly, we have a heightened awareness due to the tragedy of Sandy Hook. Unfortunately, this generation of students has continuously seen acts of school violence as part of their school experience. Throughout our country, there are several student-led organizations that are planning events to engage all stakeholders in the collective conversation to end school violence. Students at Bethel High School have indicated that they also want to make a statement about their frustration with these senseless acts. We have met with students to discuss ways to support opening a dialogue, while respecting all viewpoints and keeping our students safe. Their statement is not political; instead, it’s an expression of their concern and anger with continued acts of violence that are occurring at an alarming rate throughout our country. Therefore, on March 14 during a regularly scheduled Advisory period, students who want to participate in a student-led presentation, will proceed to the football field (weather permitting) for a 17 minute presentation to honor the 17 lives lost at Marjory Stoneman Douglas High School. During that time, they will conduct a moment of silence and each victim’s name will be read. Student leaders will also educate their peers on mechanisms to communicate their opinions as part of the democratic process (a lesson in civics). For students who do not wish to attend the student-led presentation, they will be able to report to the Library Learning Commons or cafeteria for a short learning lab. Our first goal is to ensure our students are safe and to teach them appropriate ways to express viewpoints. We will work closely with our staff and the Bethel Police Department to ensure that this experience is a structured learning experience, while providing an outlet for student expression. If you have any questions regarding our plans, please do not hesitate to contact me.